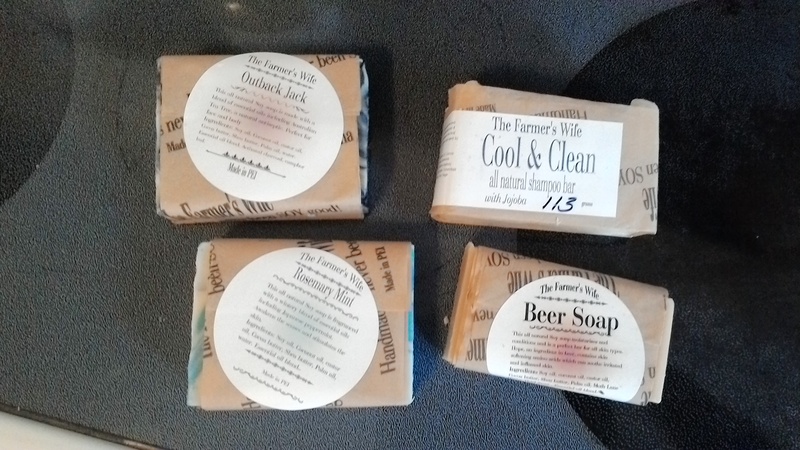 I got some great bar soap from The Farmer’s Wife. I decided to only support PEI local for bar soap. Recently I bought a bar from Bulk Barn, as my face is really broken out with eczema and acne. The soap is working, but the smell is terrible. Daniel says it smells like paint! Blah! As soon as I feel my skin is in good condition, I’m done with it! Currently I have to put it in a cardboard box to contain the fragrance. I have become very aware of fragrances and want to avoid them as much as possible. I don’t want the house smelling that the bar soap. I’m also using shea butter that I bought at the Famer’s Market a couple of weeks ago. 1 lb for $28.00. I can not remember the business’ name, but they also sell PEI honey, honey stir sticks and bees wax. 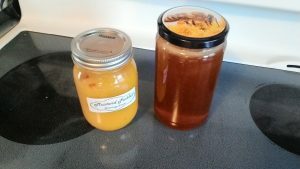 Today I bought a large jar of honey for $13.00, and I can take the jar back to get reused! I bought a jar of mustard pickles as well, from Clohossey Farms. Local and fresh. So the Rosemary Mint (smells amazing) bar soap will be destined for the kitchen sink. The Outback Jack (smells amazing) for the upstairs bathroom/shower as well as the Beer soap. The shampoo bar of course for the shower when the present bar runs out. I’m hoping the Outback Jack soap will help keep my skin calm. 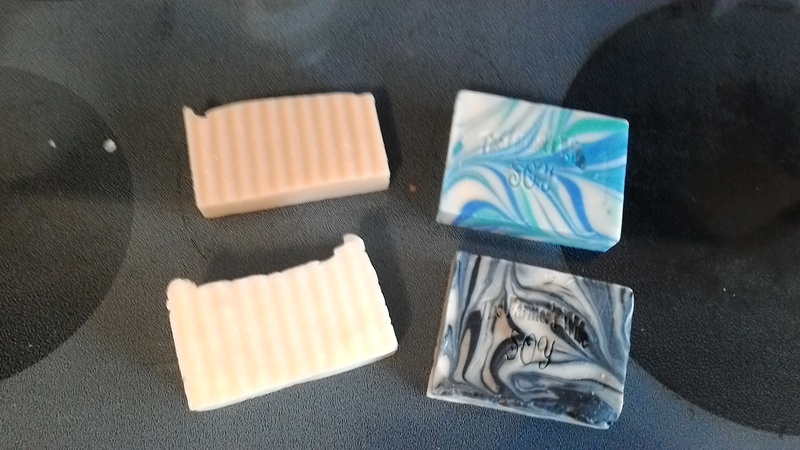 Top left is the Beer Soap, bottom left is Cool and Clean Shampoo Bar, Top right is the Rosemary Mint and the bottom right is the Outback Jack. Currently, Chris is using up the commercial shampoo, no use in throwing it away, use it up. I can not go back to it after I started using the shampoo bar as it took 2 months for my hair to adjust to the natural bar soap. Just can’t do it. All the kids, except the 2 year old, Thomas, are using the shampoo bar. I reserved the last bit of commercial tear free shampoo for Thomas. I dont want his eyes stinging every bath as soap gets on his face during rinsing. I have the tear free shampoo to use up anyways. Everyone using the bar soap for body wash. I’m so happy to get out of those fragrance chemical products!!! You have no idea!! Also, there is a big happening coming soon I found out today, but I will not share it as its not my business too . . . yet. A couple more weeks! I tell you, I am very very excited!!! Just a consideration. If you decide to purchase soap products for the eczema give Wild Prairie brand a try. My husband has eczema and we have tried a LOT of different natural soaps. IMHO nothing compares. It is a beautiful soap and lasts a really long time. A number of stores carry her product but because we’re diehard users I order a year’s supply and have it shipped to my home. Thanks for the tip on another brand. I will keep that in mind! After using the horrid smelling soap, my face was clearing up. But after switching to the Farmer’s Wife kind, it seems to be coming back. Seems so anyways. Also regarding the juice. I notice that a lot of families are cutting back on juice consumption. Like you they are offering water and it is well received. I really enjoyed reading your posts. Like you I also have an aversion to using a lot cleaning products. Being healthy is not just what we put in our mouths. It’s also what we breath and absorb through our skin. Oh yes. Your choice to Refuse Packing is an incredibly powerful tool. One day I’d love to see your name beside a social movement to force manufacturers and retailers to limit packaging. Fabulous idea of yours.